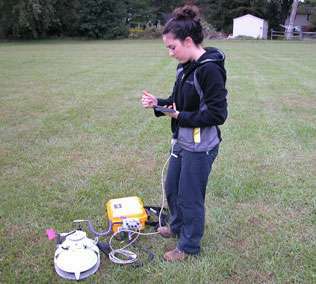 Co-author Erin Johnson collects data from a residential site. Credit: Photo courtesy of David Bowne. More carbon dioxide is released from residential lawns than corn fields according to a new study. And much of the difference can likely be attributed to soil temperature. The data, from researchers at Elizabethtown College, suggest that urban heat islands may be working at smaller scales than previously thought. These findings provide a better understanding of the changes that occur when agricultural lands undergo development and urbanization to support growing urban populations. David Bowne, assistant professor of biology, led the study to look at the amount of carbon dioxide being released from residential lawns versus corn fields in Lancaster County, Pennsylvania. His co-author, Erin Johnson, was an undergraduate at the time of the study and did the work as part of her senior honors thesis. Their findings were published online today in Soil Science Society of America Journal. For Bowne, the study allowed him to look beyond the obvious impact of losing agricultural fields to development – the loss of food that was once produced on the land. "That is a legitimate concern, but I wanted to look more at how this change could potentially impact the carbon cycle with the understanding that the carbon cycle has implications for global climate change," explains Bowne. To begin to understand how the carbon cycle was changing, Bowne and Johnson measured carbon dioxide efflux, soil temperature, and soil moisture under the two different land uses. They found that both carbon dioxide efflux and soil temperature were higher in residential lawns than in corn fields. Additionally, temperature had the most influence on the levels of carbon dioxide efflux, followed by the type of land use. Higher temperatures leading to increased carbon dioxide efflux was not a surprise for Bowne and Johnson as this relationship has been documented before. "As you increase temperature," Bowne explains, "you increase biological activity – be it microbial, plant, fungal, or animal." That increased activity, then, leads to more respiration and higher levels of carbon dioxide leaving the soils. What was unexpected, however, was that the higher temperatures found in residential lawns suggested urban heat islands working at small scales. Urban heat islands are well documented phenomena in which development leads to large areas of dark-colored surfaces such as roofs, buildings, and parking lots. The dark color means more heat is absorbed leading to an increase in temperature in the neighboring areas. Urban areas, then, are warmer than the surrounding countryside. The interesting part of Bowne's study is that the urban heat islands in the areas he was looking seem to operate on much smaller scales than he previously thought. While heat islands are usually studied on large scales – such as comparing a large city and its surrounding rural areas – fewer studies have been done to work out how development may affect temperatures on small scales. "Within a developed area, within a city or town, you could have local increases in soil temperature because of the amount of development within a really small area," says Bowne. His research suggests that temperatures may vary even across short distances due to the influence of development. One source cited in his paper says that development within even 175 meters of a location can cause an increase in temperature. Bowne is planning further experiments to test soil temperatures over a range of development setups and sizes. The other factor that Bowne will test in the future is the sequestration of carbon. Along with the carbon dioxide efflux data in the current study, information about carbon sequestration would give a bigger picture of carbon cycling. That picture could then help researchers determine how various land uses as well as management practices such as no-till agriculture or leaving grass clippings on lawns can change the carbon cycling. "If we go from one land use to another land use, how does that impact carbon cycling which in turn can affect climate change? Our current study touches on one component of that cycle, and more research is needed to address this huge topic," says Bowne. Something seriously wrong here. Soil does not constantly absorb or emit CO2. It is a transient storage facility. So bad the Phys Org should pull this article.